Just the best consumer drone that came out until now! No discussion about it. Shiny, cool, great footage, autonomous flying - you name it, Phantom 4 has it. New design, bunch of new technologies and an even easier handling: The DJI Phantom 4 continues the success story of the Chinese company DJI and inspires the whole market by numerous innovations. But what can a 1000$ expensive Quadrocopter (price includes anti-collision protection and 3D camera) really do and is it worth the change from the DJI Phantom 3 to this model? We explain what has changed and where the pros and cons of the latest camera drone lie. If you want to check out more of the professional and advanced drone models – click here. After all the models of the DJI Phantom 3 sold like hotcakes, DJI strikes again with the fourth generation of the Phantom model. Instead of matte finish, the Phantom 4 gets a high gloss glossy housing and an overall sportier outfit. 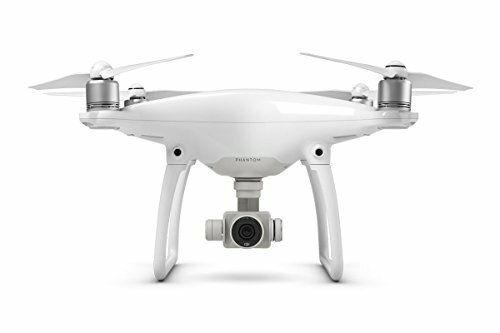 The arms are slightly slimmer in direct comparison to DJI Phantom 3, the motors slightly higher and the overall impression of the copter body is clearly of higher quality.
. DJI made changes on the camera stabilization as well: The damper unit of the previous generation is no longer visible and is incorporated into the housing interior of DJI Phantom 4. In addition, the former Gimbal that was part of the drone body unit has given way which, on the one hand guarantees premium quality and, secondly, a more comfortable feel during transport. DJI also reached high-quality haptics through the use of new materials: Below the Quadrocopter and the Gimbal there is extremely lightweight yet durable magnesium, which is normally only to be found in photo-equipment of the highest class. Different design LED lights on the arms or on the battery are noticable so are the new vents below the boom. If you do a software update on the DJI Phantom 4, you will not only see the position lights from down under, but also from above. The battery information lights also shine much brighter and more evenly. The delivery case of DJI Phantom 4 can be used as a carrying case simultaneously. The PPE-like material makes a solid impression. In addition, the case is equipped with a handle and a screw cap. So far, all DJI Phantom models were only delivered in a cardboard box. Like the previous generations, the DJI Phantom 4 is delivered in an ultimate luxury cardboard box. New: Within the white boxes hides a fairly sturdy case of a PPE-like material which can be used simultaneously as a transport case. The two-part case of DJI Phantom 4 is equipped with a solid carrying handle and a screw cap made of metal. Inside the suitcase is enough space for Quadrocopter, propeller, remote control and even two more batteries. Anyone who wants, can accommodate even an Apple iPad Mini or a similar large tablet by adhering to the specialized manuals. Overall, the case makes a stable impression – only the hinge of the two halves could buckle under circumstances and does not look really durable. Nevertheless, the idea of using the delivery suitcase as carry case, is very good and we definitely like it. For those who prefer high-quality, DJI accessories are place to go – you can treat yourself with a matching hardcase or a backpack SoftCase. The package is, as we are already used to from DJI, extensivel for DJI Phantom 4 Quadrocopter as well. The Quadrocopter includes remote control, spare propellers, a battery, a battery charger along with the connecting cable to the battery and / or remote control, power supply models for specific countries, operating instructions, gimbal clamp and USB OTG cable (USB “On-The-Go”) , microUSB cable and microSD card with a storage capacity of 16 gigabytes delivered. The camera gimbal unit is pre-assembled with the DJI Phantom 4. For the first flight, it only needs a fully charged battery, mounted propeller, a smartphone or tablet (connected to the remote control via USB cable) and an installed DJI GO app. Additional “Push and Release” -propeller cost only 9, – Euro, while optional batteries for the DJI Phantom 4 cost a considerable 169, – euros. By the way, there are changes in battery, which is now white (can be used on both sides and rotatably inserted) and comes with a slightly wider power supply connector. The remote control of the DJI Phantom 4 is extremely high quality and has, apart from integrated Lightbridge system and the conventional control sticks with a LED indicator for charging status, two antennas, various special switches and a high-quality metal mount for smartphones and tablets. The remote control of the DJI Phantom 4 is of usual high quality and resembles largely the remote control of the DJI Phantom 3 or DJI Inspire 1. As before, the image transmission system called “DJI Lightbridge” is integrated in the remote control. The remote control with glossy body and built-in battery has, aside off the conventional control stick with an on-off switch, a Return To Home button, various rotary wheels, switch to video and photo recording and a C1 and a C2-button at the rear. For an optimal connection to remote control the DJI Phantom 4 is as usual equipped with two antennas. The module at the rear has a USB port for connecting with your smartphone or tablet as well as a microUSB port for firmware updates. As with the DJI Phantom 3 Professional, the standard remote control module can be replaced with an advanced module with HDMI connection to transmit the camera image of Quadrocopter to FPV Video Glasses or FPV monitors. New on the remote control of DJI Phantom 4 in comparison to the DJI Phantom 3 Advanced / Professional is the tablet and smartphone holder that is no longer made of cheap plastic, but from grade aluminum. This provides a more elegant and noble impression. they are leaving their competition even farther behind. Autonomous features work almost perfect and are revolutionary and first of its kind in the industry. Features like spotting and avoiding barriers, tap-to-fly and subject tracking are perfect fit for noobs as well – but the drone is to pricey and valuable for me to recommend it to beginners. Pros, on the other side, can do some risky maneuvers and make stunning images and recordings.